One never knows where or when small and seemingly insignificant skills acquired over the course of a military career might prove useful and profitable. I just found a perfect side hustle for my small company, B&B Clark Consulting. I cannot count how many times while stationed overseas or deployed I purchased a used beat up bicycle. In some instanced I purchased more than one bike on a deployment when some sticky fingered never-do-well would re-appropriate my ride. I became pretty adept at maintaining these old clunkers. Additionally, like many military folks I became pretty good at operating and maintaining GPS enabled equipment. So much of our individual kit and vehicles required this knowledge. 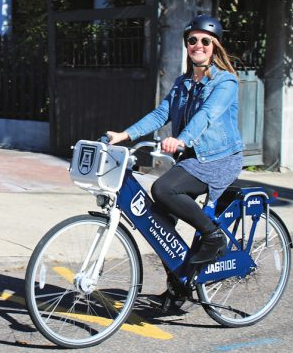 Last month I came across a contract opportunity to maintain the bicycle fleet for Augusta University’s JagRide program. A company out of Charleston owns the bikes and the prime contract. This opportunity was enough to push me over the threshold and make the decision to turn in my notice to leave my government service position. I decided last month that GS work was not a good fit for me, but this contract opportunity gave me the courage and motivation to make the move. The bikes are GPS enabled so my skills at minor bike maintenance and GPS/electronic systems come in handy. This is not enough work or money to equate to a full-time job, it is not intended to. I have several other things I want to do with this company, this allows me the time and space to do that. As a tremendous bonus, my boxer, Cooper, truly enjoys this new gig. He rides along in the truck as we check on the bikes and he is a big hit with folks walking around campus. The takeaway of all this is one should never underestimate the myriad of skills you pick up over the course of a military career. Some of those might buy you freedom and opportunity some day.